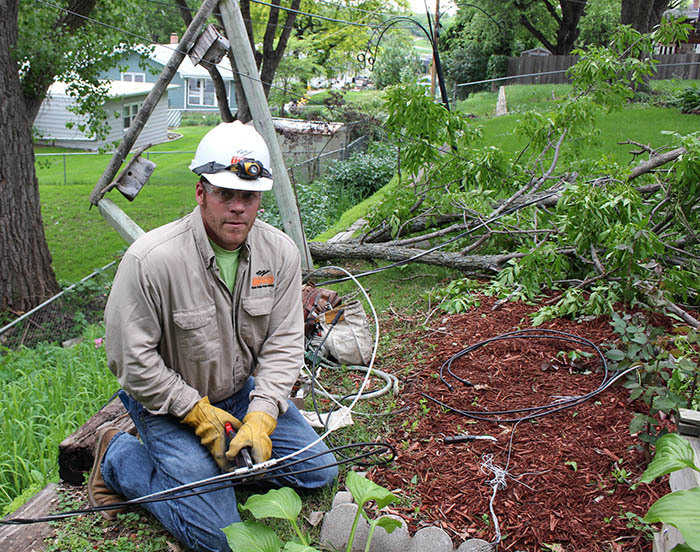 Jon White places cones before he repairs a fallen power pole during a troubleshooter call. Plenty of things can disrupt your electrical service: bad storms, traffic accidents or even animals. 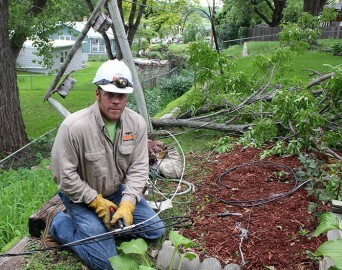 But skilled linemen like Dave Tonjes and Jon White are always on call and ready to go. 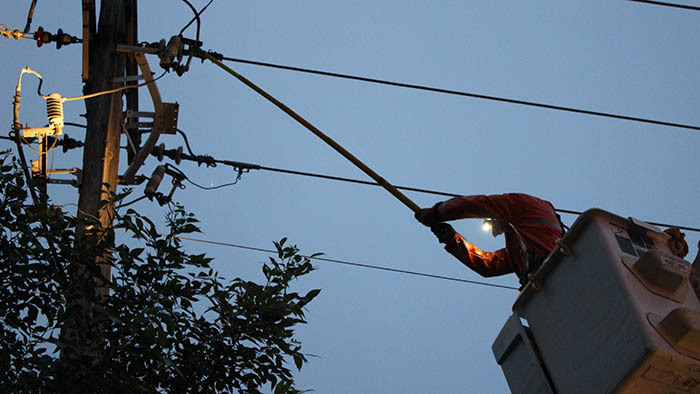 “The troubleshooter is the first responder to emergency calls, working to make the scene safe from electrical hazards 24-7 in all kinds of weather,” said Tim Potts, field supervisor, Transmission & Distribution. Twenty-one OPPD troubleshooters cover the district’s 5,000-square-mile service area. The group was established in 1992. In 2014, 14 metro-area troubleshooters responded to more than 17,000 calls sent from the mobile system to their laptops. Here’s a look at a couple days on the job for two troubleshooters – Tonjes and White. OPPD troubleshooter Dave Tonjes repairs a fuse during a call. Tonjes is a 15-year veteran of OPPD. When he’s not troubleshooting, he still helps out on the family farm outside Hooper. He’s been a troubleshooter for four years. On a Saturday evening in mid-May, severe storms were predicted for the region, and Tonjes was first on call. He was one of two troubleshooters working that shift. As his late-afternoon shift began, dark blue clouds were building in the west. 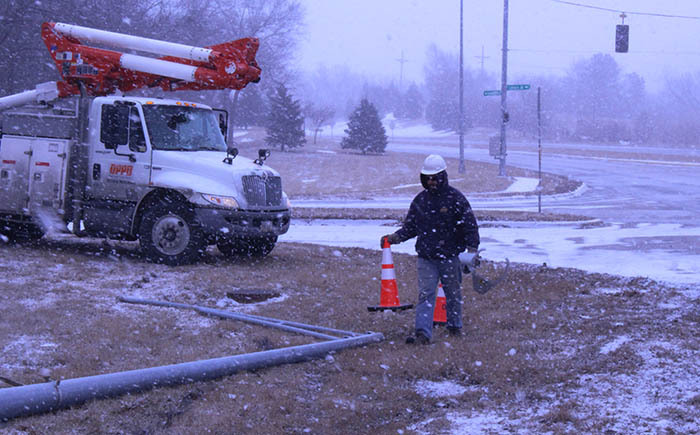 If severe weather strikes, Tonjes said, crews can mobilize quickly to deal with large outages or infrastructure damage. With the threat of bad weather, Tonjes expected a busy night. Early in his shift, he was dispatched to two separate calls to homes where trees had caused downed lines. All before a single drop of rain or upturn in the wind. One call, near Rockbrook Village in west-central Omaha, was a relatively quick repair. A tree limb had fallen and knocked the service line loose. Tonjes pulled the line out from under the tree, reattached it and remade the connection. The other call, in Ralston, was in a heavily wooded area and he needed to call in a crew to repair the top of a power pole that had been broken off by a fallen tree limb. Later in the night, Tonjes was dispatched to an apartment complex in Bellevue. The sprinkles of the last hour had become a steady drizzle. Tonjes didn’t mince words about what working conditions he liked least: Rain. At the complex, Tonjes pulled the weather radar up on his smartphone. Lots of green for the metro and red to the south. Rain was coming. Tonjes likes the work he does and heights have never bothered him. Troubleshooters have “packets” they work from – work orders sent to their laptops when not responding to calls. 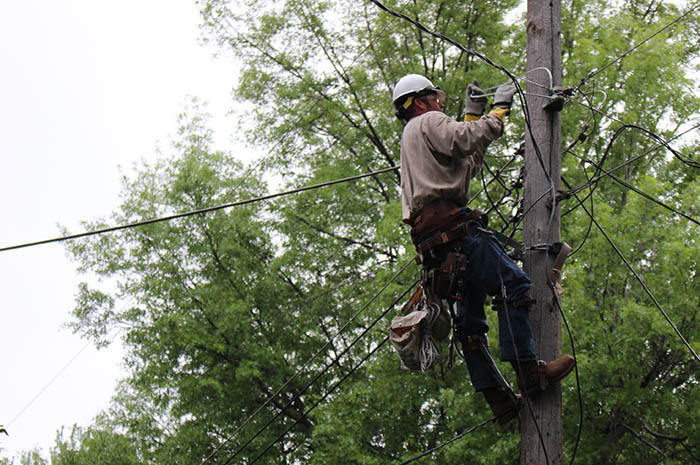 These include routine work assignments like overhead service drops for tree trimmers or permanent connections for newly installed residential or commercial equipment and temporary poles for new construction. On a weekday in February, Jon White had packet work to do installing new meters at some new housing developments. White said troubleshooters work varied shifts, 14-week rotations that switch between days and nights. They see the city from every angle and under every condition. And when the weather gets bad, troubleshooters respond. Like on a day in February when temperatures were in the low 20s and winds had plenty of bite. Some unexpected snow left the streets slick for the morning commute. White was dispatched to 210th Street and West Maple Road where a car slid off the road and knocked over a light pole. 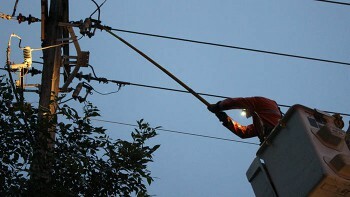 Dave Tonjes repairs a line high on a power pole during a troubleshooter call. White got out and checked the area, then placed safety cones around the pole. He filled out a work order to have the pole replaced then went back on patrol. Potts said troubleshooters save the company time and money because they can respond to a wide variety of calls and can complete a lot of the work themselves. They also help cut down on outage time for the customer because of their quick response times. Later in the morning, White was sent to La Vista Junior High. A construction crew struck a main power line while digging a trench. White quickly determined the line was live. He ordered everyone to stay out of the trench and started making phone calls. The job would require a large crew and special equipment. Working through the night in sub-zero wind chills, the crew replaced about 900 feet of buried line as well as the transformer. School started at the normal time. Situations like that can be common as troubleshooters often have to make quick determinations with limited information. Tonjes was dispatched to a house that had lost power near Elmwood Park Golf Course near the end of his shift. Behind the house, Tonjes found the power pole covered by a thick overgrowth of mulberry trees. It was dark and he couldn’t see the line through all the tree cover. He went back to the truck for his extendable chainsaw to get a better view. By then, the rain was a full-on downpour. Tonjes was in the tree and sawing away to get to the line. It took an hour and a half to clear the area and get the repair done. The overgrowth had caused the line to short and he had to replace a section of line. Afterwards, Tonjes’ leather tool belt was thoroughly soaked. The belt weighs about 50 pounds when dry. “It’s going take a week for that thing to dry out,” Tonjes said. He takes it in stride. It’s a tough job, even in the best of conditions. But when the lights go out, OPPD’s troubleshooters are the ones working to get your power back on as quickly as possible. Great article Jason! Jon and Dave were great subjects to highlight! Thanks Tim Potts for your comments. Thanks gentlemen for a great story. Going to share it on my Facebook site. These are the stories people need to hear about! When people are upset about no power they need to remember that OPPD workers are out there working hard, in terrible conditions most of the time, because they want to get that power back on for our customers! They are someone’s family member and we want them working safely so they can return to those family members! Always be patient! Thank you for the work you all do and thank you for this story!! Next Next post: Renewables, infrastructure: What’s ahead in 2019?